I’ve been following this blog Dementia, Caregiving and Life in General written by the daughter of a woman with Alzheimer’s Disease for a few years now, and her blog today has started me thinking again about forgetfulness. As a person living with a dementia, I’m not sure which is worse, not remembering, or being forgotten. I certainly know it is frustrating, and also often quite annoying forgetting things. Forgetting is sometimes deeply painful as well, as I discovered once again in Milan earlier this year. But, I can also say, the first time it was obvious to my husband I had forgotten his name (not yet who he is), it looked like I had punched or kicked him in the stomach, really, really hard! Often these days, I have to fudge knowing people’s names, sometimes even knowing who they are at all. Phone calls are especially challenging, as most often, people just say ‘hi’, and expect you to recognise their voice. Or ‘hi, it’s Jenny’, and then I’m expected to know which Jenny. However, for the person with dementia, or our family or care partners, the fear of forgetting, or of being forgotten, is probably not a phobia at all, but the anticipatory grief of dementia. V says “yeah” about the anticipatory grief of dementia. She’s had a couple of insightful, slightly sad days. Said tonight “I miss you”…as I do her, now n’then. Maureen often thinks that family members do not know where we live. I wonder if this is fear of being forgotten or forgetting that they have all been here to see us at some time or another. On the other hand it may be her way of expressing disappointment that they don’t come to see her very often. I wonder how that feels for a mother? Thank you for reading my blog. 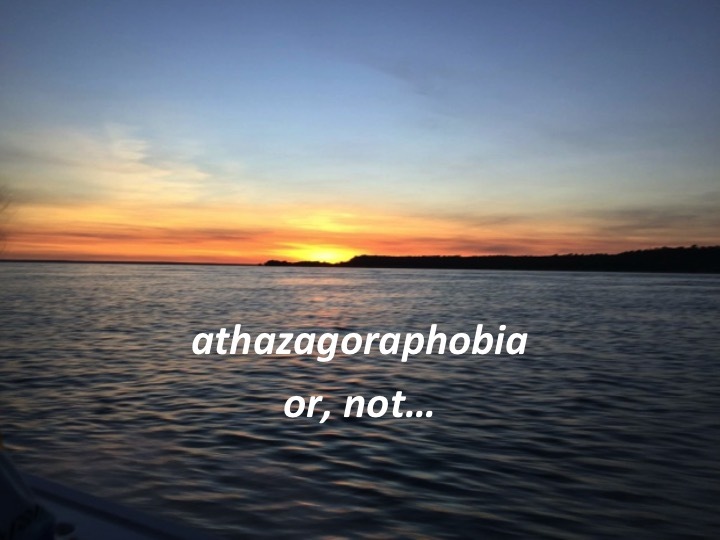 As always I am grateful to hear about it from your point of view, and I’ve learned a new word – athazagoraphobia. Names have always been difficult for me, and I suspect the same for my Mom. So I’ve never asked her to name me or others. Perhaps Mom had reached the stage where she cannot remember my ‘now’ face, hence the confusion. In any case, we are all learning to live in the moment. Wow. This blog hit home several times. Forgetting vs Being Forgotten. Anticipatory Grief vs Phobia. During the last very difficult year of transition for Gregory, I never once asked him to tell me my name. I was so afraid he would not remember. Your are right. Anticipatory grief. Eventually, I think I asked for name verification only once and he failed. I refused to ask again because I am terrified of the results. Recently when I arrive for my daily visits, he will look at me a little longer before recognizing me but then again he has had trouble focusing on things for maybe a year or so. So I stand at what I have learned to be the correct distance, I speak loudly (which I usually do, being used to teaching a classroom of 200 :-), and sometime repeat, “Hi. It’s me! Hey I’m here! I love you! Look at me!” Sometimes I will say “Look at me in the face,” sometimes twice or three times and he will be able to eventually do that and he will smile at my presence. Sometimes I realize that he is too distant in contemplation and instead of forcing him to respond, I either come back later. Sometimes I shower him with kisses and either he receives them, waves them away, or ignores them. Having acted however, I feel successful in having announced my arrival. More often than not he gets very exited to see me, he laughs, or reaches out for a kiss and hug. Once in a while (I usually melt when this happens) he will say something like, “Oh my Michael. My Michael.” That is enough for me. Being a teacher of young children, you get used to not getting reinforcement for the work you do, rarely do you discover what your efforts turned into. So you get used to giving yourself compliments, knowing when you did a good job, sometimes knowing when you failed and trying to learn from it, but basically learning how to self reinforce. You get used to never seeing a finished product in your student. So that ability I have developed helps with Gregory, I do a lot of self reinforcing. In fact when others reflect on “how good I am” I get embarrassed.